Location: County Kildare, Northern Ireland. 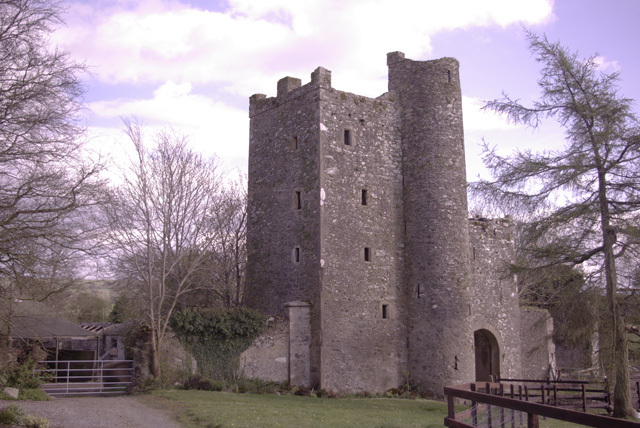 Notes: A substantial tower house was built to strengthen or replace the earlier defences in the 15th century. This rectangular, five-storied structure contains four floor levels above a barrel-vaulted basement with a second vault over fourth-floor level. It is adjoined to the southwest by a gatehouse and was originally adjoined by a bawn. An 1833 depiction of the castle in the Dublin Penny Journal shows a steeply gabled house adjoining the gatehouse, possibly of late 17th or early 18th century date. The archives of Trinity College Dublin contain an undated drawing from the Edwin Rae Collection depicting a similar building. A cannonball, possibly of 17th century date, was recovered from near the castle in 1901.